My flights had been booked since Christmas: Dublin to Bangkok, at the end of May 2016. I had spent the past two years dreaming about going to the Thai Fruit Festival in Chiang Mai, a vegan cycling event organised and hosted by the Youtube-famous couple from Adelaide, Australia – Freelee the Banana Girl and Durian Rider. If this doesn’t sound like a colourful story full of interesting characters and concepts already, I don’t know what will. To outsiders of the vegan online world, this festival and the ideas behind it will certainly need some explaining. I have to remind myself that this part of the adventure is not something entirely within the immediate comprehension of my peers or the general public. Just a brief synopsis of the community and lifestyle in which I have dabbled over the past year provoke surprise reactions and curiosity. Cycling 500km a week, eating solely bananas for 30 days, living in a house with no lights, filming daily activities, not consuming an ounce of alcohol while in Asia – these aren’t the common narrative trails which usually populate a graduate’s travel diaries. The Fruit Festival in Chiang Mai was a free event created about 3 years ago and quickly attracted hundreds of people over a short amount of time (we have social media to thank for this). 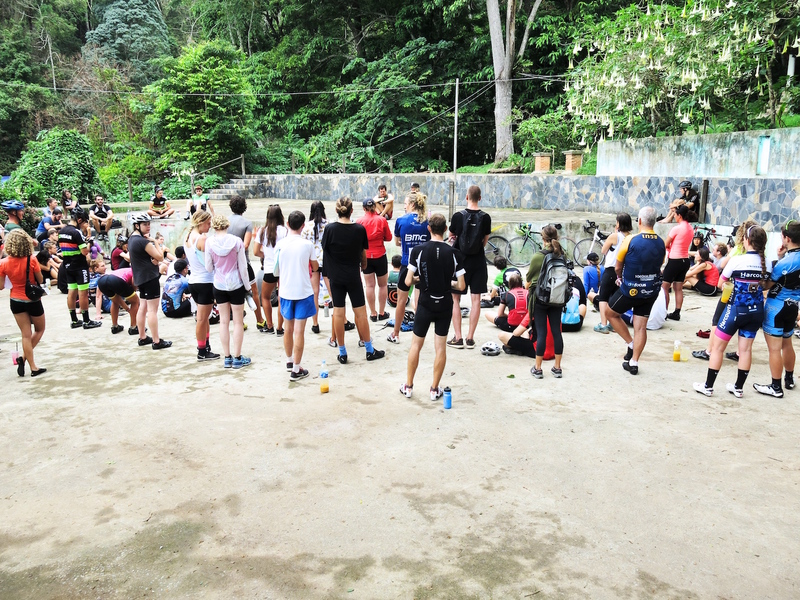 For a month, vegans from all over the world could come to Thailand to hang out, eat fruit and high carb buffet dinners together, cycle, run, travel, meet the locals, participate in Q&As held by Freelee and Durian Rider, and tackle Doi Suthep (a 10km steep mountainous climb) on the bike every morning. This was extremely appealing mainly because let’s face it, vegans are a minority group, and spending time with and meeting like-minded people presents relief and great fun. I’m writing today from the cafe ‘Picante,’ which is just beside ‘The Tin Pot Café.’ I’m in Melbourne now. When I had Picante’s coffee to take-away before (it’s good) I took a snoop through the interior, and quickly decided it was the nicest cafe I’d ever seen. Cafés in Melbourne resemble pockets of glorious hidden discoveries, as if they’ve jumped straight from The Secret Garden. ‘Picante’ is a Pandora’s box – the coffee machine placed behind wooden framed windows which open onto the pathway and wooden tables, in an unassuming poky room with French comic posters. Continue down the narrow corridor and you enter a new room hidden from the front, with a fireplace and stack of wood, giving way to a courtyard which reminds me of the beer gardens in New York. There’s a chess set placed in the middle of a large table, and overhanging vines entwined on wires create a sparkling enclosure. I finished my last college exam in mid May 2016. My only exam actually, as the majority of my coursework consisted of essays and dissertations of diabolical lengths. I had absolutely no apprehensions at this time about my undergraduate education coming to an end. My aunt told me to watch out, that she had felt totally lost when she finished and really missed her college lifestyle when it was all over. “Oh no, I’m totally ready to leave,’’ I had confidently responded – I knew exactly what I wanted to do with my life, right, I had planned a month in Thailand and then by the end of the year I would head off on the graduate visa with a nice job sorted for myself in the USA. I had absolutely zero notions of anything beyond this, and practicalities and logistics didn’t really figure in my worldly perspective. I couldn’t understand other students who had no plans after graduation – I had far too many. “I know exactly what I want to do.” Thankfully no one asked me to explain exactly what that was, because now I’m not so sure I would have had a well prepared answer, other than “I want to work for something I believe in which is in line with my core values and ethics and I will never work in hospitality again.” I had vague ideas about applying for jobs on indeed.ie in San Diego – about fifteen options had popped up after typing ‘journalism’ into the search bar, surely that was more than enough – loads! Also there was a magazine somewhere which hired interns, I’d be able apply for that too. I was definitely ready to leave Ireland, though. I had a job set up in the south of France on a campsite after my month of vegan galavanting in Chiang Mai. I’ve been going to France every summer for as long as I can remember. We’d pack the car boot to bursting point, and I remember my parents standing with their hands on their hips consulting each other anxiously about whether one side of the car was lower to the ground from the weight of the luggage (it definitely was). After the ferry to Roscoff, we would drive the length of France before searching for campsites (this took an obscene and cruel amount of hours during an age where portable electronic entertainment did not exist – and if it did, we didn’t have it, and it was just too bad if reading a book made you car sick). My little brother sat in the middle in a child’s car seat and would scream and cry for hours, refusing to let either myself or my sister lean on the side of the plastic contraption to aid an hour or two’s sleep. We always got lost, and after one particular screaming match between my parents (my Dad always refused to ask for directions, only consulted the map, and had very bad luck) we ended up parking the car in the dark in the middle of no where to sleep for the night. When we woke the next day, we realised the car was perched quite precariously on a cliff edge, but the view was magnificent — we had discovered the Dordogne, and came back to this same spot every summer for over ten years. After several camping stints, one particularly horrific flooding experience prompted my parents to look into buying a house in the area. They did, and we acquired a second home. When I became ‘too old for family holidays’ I still came back and worked in campsites in the area. Last summer in 2016, however, I wanted guaranteed sun, and abandoned the unpredictable conditions of the Perigord Noir for a job on a campsite near St Tropez. I am now sitting outside The Age newspaper building headquarters, using the stone bench by the lawn as a desk, eating my beans and rice from a tupperware (I also brought a potato wrapped in cling film today, we’ll see how that goes) while struggling to keep my flowing hippie tie-dye dress which I bought in Bali from blowing up into my face with the wind. I eat my lunch in this spot most days, as it’s right beside the gym and outside Woolworths. I can pretend I work there at The Age, as a journalist (instead of at a smelly stressful restaurant), reflecting on the billboard headlines which flash above me, using the building’s wifi. Penguin headquarters are just around the corner, so I might as well be the editor there while I’m at it. A recent study showed that waitressing is more stressful than being a neuro-surgeon, and I’m not surprised.